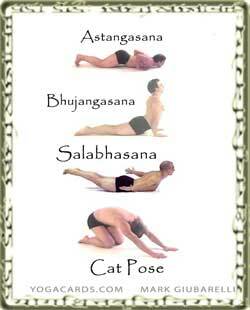 This Flow can be part of a Sun Salutation or it can be repeated a number of times for a healthy lower back. Lower down with the chest chin and knees. This is Eight Limb Pose. Lower down into Locust pose with the arms out to the sides and the legs pushing together. Place the hands down under the shoulders and push up bringing the knees down and in. Exhale back and up to Cat pose. Printable Vinyasa Yoga Cards. Click on any of the images to get to printable page.